Wind Waker, Heart Breaker | 2P START! To make up for it, I’m even including an alternate 3rd panel to this comic. I think I prefer it over our final decision, but that’s for you to decide. While Ray wasn’t too impressed with Nintendo’s GDC offerings, I can’t complain since the announcement of Spirit Tracks gave me the idea for this week’s comic. I was especially proud of my idea due to its timing, which was within a day of posting last week’s comic. Of course, I did pick the weekend of Ray’s big move to be early, so it didn’t help Ray much, but I still think he did a fantastic job with the artwork. Anyway, hope you enjoy! I think this is the first time I strayed from clean vector lines for more of a scraggly brush look, but I think it was worth it to fit with the style of Toon Link. I mean, I know Spirit Tracks is kind of a lack luster announcement, but I don’t think the comic really reflects that. If the joke is that the image can’t load all the way because Nintendo ran out of ideas, then I think this is a lame comic overall. That has to be the most beautiful shade of pure white that I’ve ever seen! I just wish you didn’t ruin the image with that picture thing at the top! Man, if you just fixed that little bit, it would be a masterpiece for the ages, but now it’s just some monstrous abomination of death, desperation, and debauchery. Ha, now tim will be all powerful, not only can he by the world with his swimmingpool of money, but he wields the tri-force too. Meh, not my favorite. Mainly because GDC wasn’t even hyped up at all and that I’m very excited for Spirit Tracks. I can’t see the comic. I’ve tried multiple devices and browsers but I still can’t see it. Strange since it looks like everyone else can. I just assumed that they only put up the top of the comic because it is April Fool’s Day and they’ll put up the comic properly tomorrow. Ditto. I like youtube’s thing though. Putting a whole bunch of upside down oriented videos (A cat hanging upside down etc.) and turning the videos upside down too, so everything is right side up. And for those of us iPhone/iTouch jailbreakers Jay Freeman (creator of Cydia which is basically the jailbreak app store) saying that Cydia has been bought out by Microsoft is absolutely hilarious to me. You know, at first I was trying to view this comic on my iPhone and I had just assumed it wasn’t loading. Ahhhh! I think I’ve broken my refresh button! Can’t… load… the… comic… ! I know there’s no image there, but part is still waiting for it to load. I’m starting to hate April 1st. We ARE getting a real comic tomorrow, right? I’m going to try to reload it, sorry guys. I’d say just linking to it in the blurb would be fine, that way people who come later can still see the joke (and not be confused by comments) but get to the comic anyway. I thought it was clever, but I was hoping that a link to the real comic would be somewhere. Oh, the image got bigger… just gotta wait a bit longer I guess. I’ve been buried for too long! I’m rising this week because Zelda is my favorite game, and this comic was just great! Not that I haven’t enjoyed your other comics, but Zelda=win. Anyway, NCG! Who else was able to find that slightly off-color pixel near the bottom? The one that links you to the alternate version of the comic. Pretty funny, though I understand why Ray hid it. I never thought I’d see that many F-bombs on 2P Start. Sorry, but you must purchase the 2P Start! 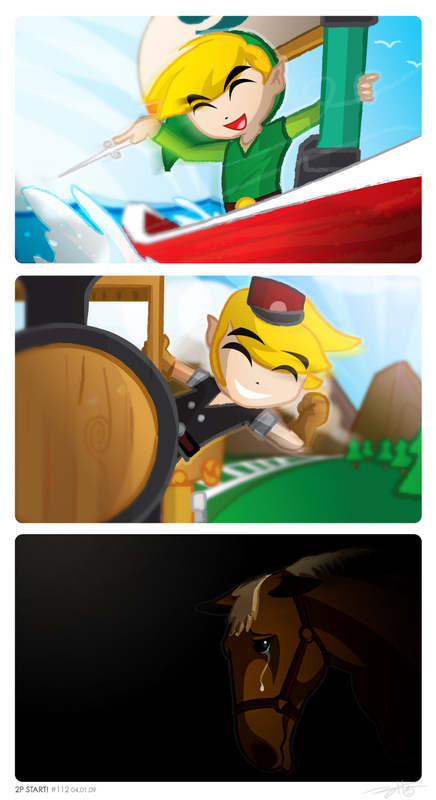 DLC, Wind Waker, Heart Breaker: The Prologue to view the rest of this comic. Comics like these are the reason I keep coming to this site. You read through the comic once, and you don’t really get it. It’s only after you read through it again that the joke finally sinks in, and when it does, you find yourself disturbing everybody in your household with laughter. This comic USED to be good. Can I get a Wallpaper out of the second panel? OH MY GOODNESS!! I JUST GOT AN INTERNAL SERVER ERROR!! APRIL FOOLS DAY IS KILLING 2PSTART!! So I guess the comic is gradually coming up as the day goes by? Nope, it’s still half of a panel. I have an idea, Let’s boycott them. What’s a comic without its two readers? Come on, guys, this isn’t funny! You better put up the real comic or I’m going to . . . do . . . something . . . But seriously, post the real comic or I (and many of your loyal fans) will be upset. But I just have to say that you actually fooled me (Gawd I hope I’m not the only one). I was sitting at my computer for five minutes waiting for it to load before I realized the joke. Speaking of that, you two owe me five minutes of my life back!!! Sorry for the triple post, but I just had to write this! It looks like Ray got a little lazy with the comic this week. He didn’t even finish it! Thanks. I had to get that out of my system. I would put it all into one post, but CAN’T because we don’t have POST EDITING!! Gawd why does April 1st have to fall on a Wednesday this year?! Well at least it doesn’t fall on a Monday. I don’t want to know what you guys would do for that! They already did it. Remember that podcast that didn’t have Tim in it? Yeah. And actually the picture has loaded more than it did before. This morning you could barely see part of his left eye. His mouth and right eye weren’t there. Anyway, my raise from the grave comment was suppose to come with a correction of haven’t done instead of have done…. …anyway, the whole sega smash bros thing was what would happen if Sega made smash bros. You know, like a “screen shot” of what a character selection screen would be of it….especially since it have about 100+ characters all with the same move set. What’s the move set like? Well, it be like Kirby’s standard b attack……sucking. I was kind of playing off the “Sega Creature Creation” comic. Time for a second comment you told me to make…..
…Listener submitted black doom awards. I would of made this on the podcast comment section, but I’m lazy. Well, you tricked me. But in all honesty, the joke is more annoying than funny. However, from what I can see so far, the art looks great. And the logo’s really clever too. You know just because its April FOOLS Day doesn’t mean you have to make a bad joke. I don’t think Tim would do this kind of joke…. …But then again, he did look me over as a grave riser till I said something. Can’t blame Ray for that, he’s only the slave…I mean artist. When I got on I was like “I wonder what they’re going to do for April Fools” and then I saw it and I was like “Oh nothing”. And then I scrolled down and was like “never mind”. this is the only funny april fools joke I’ve seen all day. This may possibly be the best/worst comic ever. I’m in suspense mode. Oh yeah…I got one of those too…I forgot to mention it though. XD Sorry. And I still get extremely large slow downs every 2 hours. Oh also, I find it kinda funny that this comic wasn’t posted in the morning like some of the others…. Gosh Ray, your Art sicks, Imean my sisten could make a better white panel! No seriously GREAT COMIC GUYS!!! i dont get the joke unless the joke is a part of a white page? or its april fools joke but still dont get it. Holy crap! I figured it out! Obviously since it’s white you have to highlight it. Duh. Anyways, NCG. I liked what youtube did. I liked Youtube’s gag too. Also, there’s more now then there was this morning. Interesting. I don’t get it. April fools? Better than last year. International Rick Roll day. It was funny once, but after every website (ever) did it, it got old. Really fast. Its funny how many comments there are when there’s no comic…. The Wind Waker, Heart Breaker comic isn’t loading on my Vista. It may be my computer or it may be the website. If it’s the website, I just wanted to get you guys a heads up. Ok, it’s not April Fool’s Day anymore, you can put the comic up. Now its borderline annoying to be quite honest. Yay, first post since the actual comic has been published! The art in this one is great. The first panel would be a perfect desktop (if I could bear to give up my Lego Indy). Awww. Poor epona. She always gets left behind when you get the ability to use other transport (see warping etc). I like the art a lot this time Ray. Nice one. Not sure which of the two I like though. Ended up being pretty good after all. But worth the wait….? …What? You guys said you wanted people to rise from their graves. I just felt this would be an appropriate way to do so. With Thriller. Anyways, that out of the way, the comic is nice. Poor Epona…wait, has there EVER been a toon Epona? o.O I don’t think there has….Maybe Nintendo can’t make a toon horse? April fooled? Was that the comic only being the first panel? Ugh too much reloading!!! I thought my computer was messed up. DANG IT TIM! I HIT THAT RELOAD BUTTON ONE TO MANY TIMES!! This comic used to be good…. Poor Empona! *looks at alternate final panel* POOR EMPONA!! DON’T DO IT!! I’ll keep you, and feed you, and rid you around college down here! EMPONA!!!!! NO!!!!!!!!!!!!!!!!! Also, was it just me or did Link not have the Wind Waker in yesterday’s comic…? Poor Epona… but you know, I’m really questioning if this comic was worth the wait. Please guys, don’t do this again next April, it was more annoying than funny, I wanted my comic! That was the best comic you guys have done in a long time. I loved it. The alternate 3rd panel was better, I’m with Ray on this. Ok, I thought yesterdays comic was much better, I mean think about the depth! That blank white scren really challenged out traditional thoughts of what is a comic, we were required to really look into outselves and reflect on human nature! This one is much more traditional, but still challenges us to really question our inner sadness, I mean the darkness not only represents Epona being left behind, but also challenges us to realize the evil of technological innovation. Man, is it just me or does the second panel look like Epona got ran over by Link and was crying before it happened. Told you Ray was a total sadist. Or maybe he just hates horses. Well anything except for hedgehogs. Thank you so much for posting the real comic. I love you guys again. In a not gay kind of way! But anyway, about the comic. Ray, I bet that PETA would be very upset to see that “alternate 3rd panel”, don’t you think? But I’m sure that PETA wouldn’t be nearly as upset with the actual comic because, you know, at least Link wasn’t riding Epona as if she was some sort of . . . some sort of . . . animal! But really, I miss the good old days of the Legend of Zelda where Link actually rode EPONA instead of a TRAIN! I personally hope that Nintendo will make a Legend of Zelda game that stays true to what made the series great like games such as Ocarina of Time, Majora’s Mask and Twilight Princess. Down with trains, long live horses! Haha did you write that yourself?? I’m not gonna lie, it took me a while to realize where the qute was from. I feel dumb! I hate April fools day when it comes to the internet, everyone seems to play a prank that lasts all day and makes various sites unusable. 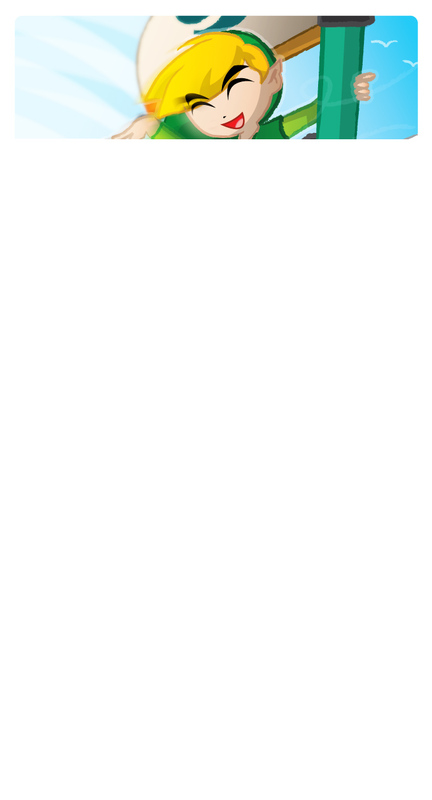 For example, two of the Sonic forums i visit re-did their look to look like the forums from 1998, and everyone spammed the place like newbies. best comic in a while, art-wise and concept-wise. I love it! Was Epona in any of the Wind Waker style games? Is this canon? Does anyone care?…Anyway, great comic. I take back this comment! You are all cruel and unusual! That’s it! I’m un-rising from my grave! -jumps back into grave and waves- Good bye cruel 2pstart! Nope, I got it from Google. I’m not a fan of the song, but it’s perfect for zombies and graveyards, so I decided to use it after hearing the podcast. And no. There is NEVER enough free time. EVER. Saying there is enough freetime is like saying there is enough Dakka. Aww, that poor horse looks really sad. yes, you won’t get anything else from me but that. Sorry, it was too long for the box dealy I guess. The thing is…you don’t really use Epona that much anyway…what 3 games max? Not enough to get attached really…. Crap, deleted part of the tag by accident. Feel free to delete the above comment. There was OoT, MM, FSA, and TP where you used her, but she also appeared in MC. Also, I enjoyed the comic, but if you do something for April Fools Day again (although it’ll be a while before it’d fall on a Wednesday again), I would suggest having some way to access the real comic as well as the joke, so that way you still get to use the joke, but people would be less upset. Maybe it could be the first comment so it would at least be off the main page and not obvious right away. OMG, we are only 5 away from 100 comments, lets go guys comment, comment, comment! cmon guys own up, if you hit the reload button more than 10 times, you def. got april fool’d. no big deal jsut laugh, that’s what it’s all for, right? Hmm….where have I seen this before? …SEE WHAT YOU ALL DID?! Arg! I’m not goin’ lie, I want to be comment 100. Sorry you all, it was just too tempting. Psssh, comment 101 is where it’s at. Here’s another version of the comic I whipped up. You guys should totally do a comic about the new Nintendow DSi or the Pikmin franchise (mainly the upcoming Pikmin 3). I bet you could design it pretty good, Ray. And with Tim’s jokes, it would be hilarious! …I’ve lost the will to live. This would be more impressive if you clearly didn’t just rub peanut butter on the horses eye to make it look like it was crying, then dub in the tears. gIvE mE cOmMeNt Of ThE wEeK! Man, I missed it.. I seriously forgot about April Fool’s. Darn.. all the people I forgot to prank, aaaaaaargh!!! Anyway, this was nice. I didn’t really find it humorous, but I do get the joke. I do have to say that the artwork is really good. 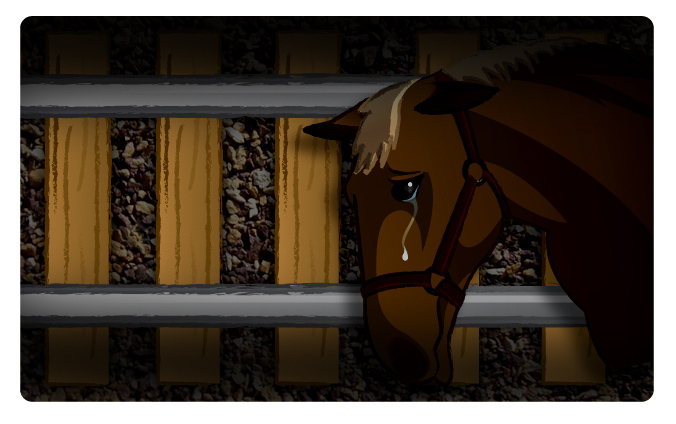 Oh, and the final Epona panel.. The one here is better than the alternate, it gives a better feel of emptiness whereas the other one with tracks just serves to muddle up the image a little. Sorry fellas. Due to the out-loud-laughter inducing properties of this week’s comic, it looks like I couldn’t help but vote for you on joystiq webcomic-y poll thingus. Not to mention that there is a great “that’s-just-wrong” factor helping out too. Great stuff. Keep it coming. Encore! Dude, I SO second you there. Oh wow I got an internal server error shortly after that last comment. I just thought it didn’t want to load. Internet problems aren’t uncommon for me. I just thought, “I’ll check back later,” and when I did a couple days later, it was fine. I didn’t even realize it was an April Fools joke until just now when I read the comments. That said, the comic is brilliant. Poor Epona. Daniel Radcliffe will comfort her. I LOVE THE ARTWORK FOR THIS STRIP!!!! Just realized. THIS is the comic I came to 2P START! from. It was some article talking about April Fool’s jokes this year. I fail for not remembering. Ah, Toon Link never rode Epona anyway. Oh man this comic just broke my heart a little. I have not played a zelda game since majora’s mask, i had no idea Epona had been so forgotten. How can Link possibly defeat Ganondorf without Epona damnit!? Also, the Spirit Tracks train thing is perhaps the stupidest thing i have ever heard of. Is there anything less Hyrule-esque than industrial revolution and complex machinery without the need of magic?